Well, this is awkward. On Monday, as tens of thousands of people watched in St. Peters Square in Vatican City, Pope Francis appealed for an end to unrest in Ukraine. 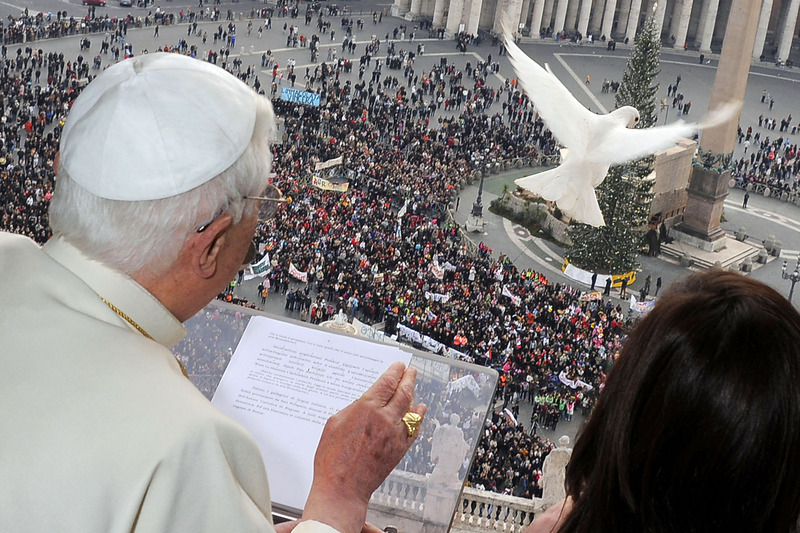 In a symbolic gesture, the pope released two white doves from the window — and then watched as a crow and seagull proceeded to brutally attack the birds. In full view of the crowd. If you just snickered, you're also a terrible person. Amazingly, this demonstration of Old Testament-esque violence against peace doves has happened before. At the same event last year, after two doves were released in a peaceful gesture, a seagull swept in and began attacking them. (No word on whether it's the same, vengeful seagull.) You don't need us to explain how painfully symbolic both attacks are, especially in view of all of those thousands of people. On Monday, both doves eventually escaped, though a few feathers were lost and drifted down to the crowd in the process. A young boy and girl had released one dove each from the window of the Apostolic Palace, and the Associated Press reported that the girl couldn't help but laugh when the symbolic doves were attacked (come on, wouldn't you?). The boy, however, "looked upset at the bird's misfortune, prompting the pope to embrace him and pat his head." Oh, well. Better luck next time, guys. In the meantime, you can find out exactly what's going on in Ukraine here.